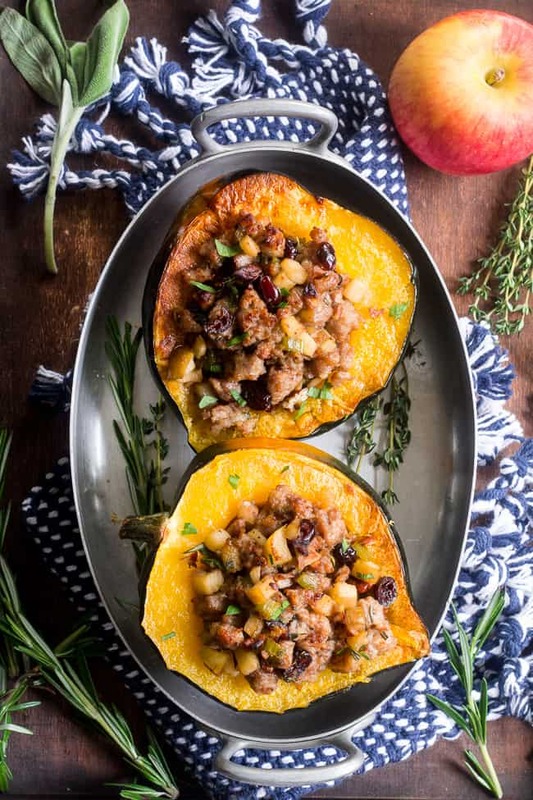 This Roasted Stuffed Acorn Squash is filled with all your favorites – sausage, apples, cranberries, onions, celery and savory herbs. The stuffing is packed with savory/sweet flavors and the perfect addition to a holiday gathering, or for any meal! 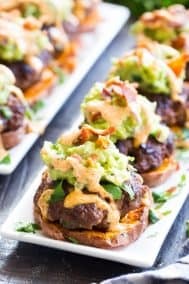 Paleo, gluten free, Whole30 compliant. 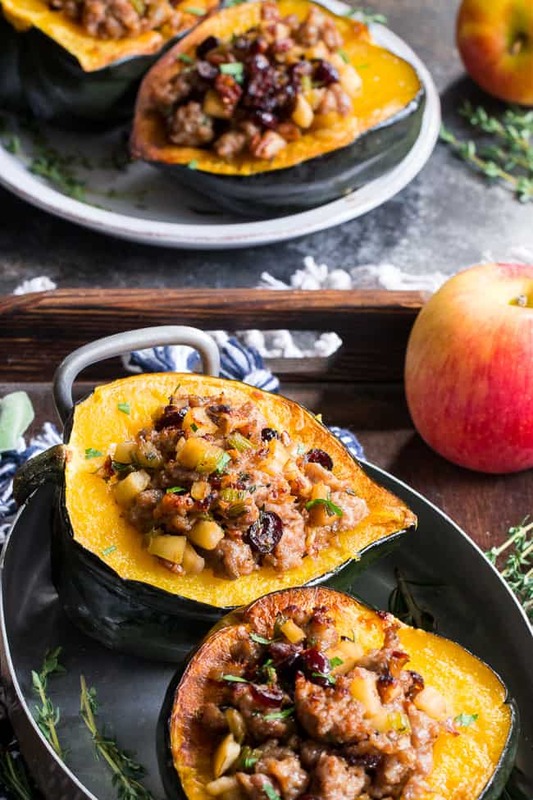 I’ll just come right out and say it – stuffed acorn squash is one of my most favorite foods OF ALL TIME. 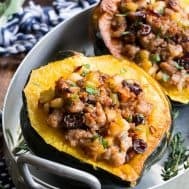 Seriously, if you had told me just five years ago that I’d make such a statement, I would’ve been pretty darn confused, given that back then, I didn’t even know what an acorn squash WAS, let alone how/why/with what I’d be stuffing it. So, hopefully many of you are already far more enlightened than I was back then, but if not, no worries at all! You’re in for quite the (Paleo & Whole30) treat. Meet your new best friend – the acorn squash – shown above. The name comes from its shape, and trust me, the inside tastes way better than it sounds, especially after being roasted. To be brutally honest with you, I love it more than butternut squash. 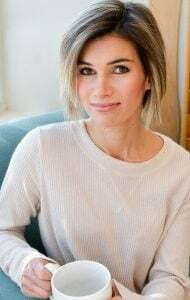 Plus, I find acorn squash easier to prepare – they’re not at all the hassle that butternut can be, making them a pleasure to work with, and then of course, to eat. Now, like magic, after roasting your acorn squash and stuffing it with, um, basically ANYTHING, it becomes downright addicting. 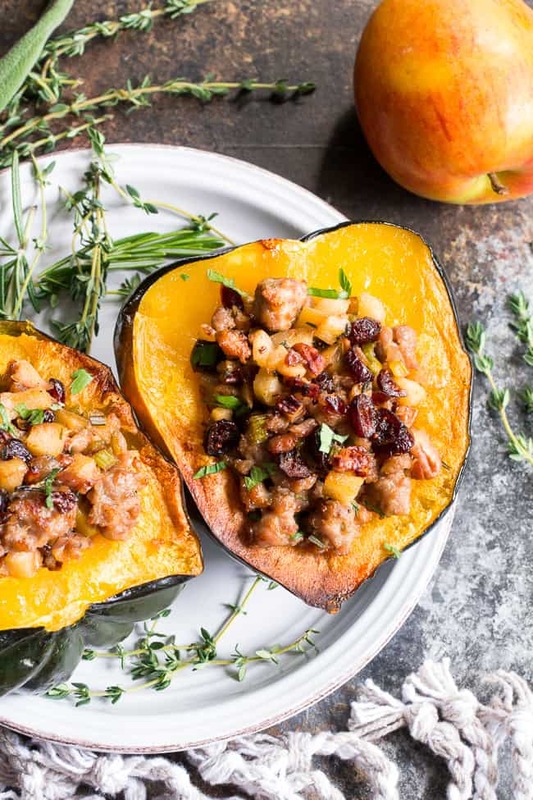 Seriously, forget the chocolate and treats – this is the real paleo crack – roasted and stuffed acorn squash. You might remember me saying the same thing about last year’s caramelized onion, sausage, apple and spinach stuffed squash. Well, this one is just a touch on the sweeter side – with fruit-sweetened cranberries (holla!) toasted chopped pecans, and no spinach, but MAN! 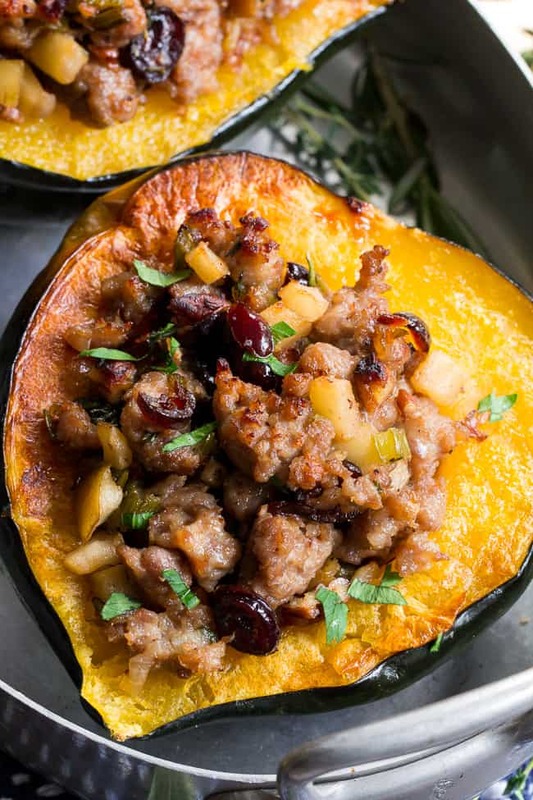 You can’t really go wrong when you stuff an acorn squash. No doubt that after trying it (and seeing for yourself how easy it is!) you’ll begin a lifelong acorn squash hoarding problem, like I’ve had for 3 years now. September comes and I just can’t say no when I see all the squash at the store! Which is why I have quite a few hanging around in bowls all over the place. My kids don’t know if they’re food or decor. And, I haven’t even begun to address my delicata problem yet. More on that one next week! Okay here’s the deal – you roast the squash first. It only takes about 30 minutes, just enough time to get all your filling prepared. Chop the veggies and herbs, cook the filling on the stovetop, stuff the squash, then broil for a few minutes until you get a nice “crisp” texture on the stuffing and around the edges of the squash. Then, voila – the most delicious thing you might eat for a very long time. Or, at least until the next time you roast acorn squash. Now, you might be wondering what to serve this with, and the answer, is that it’s completely up to you! 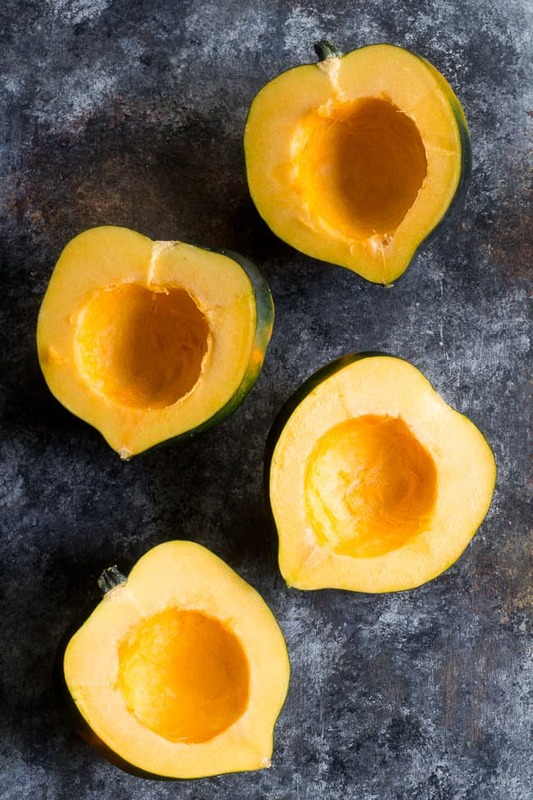 You can absolutely serve this as a holiday side dish – as a side – it will serve about 8 people, though you’ll have to cut the squash halves in half, or just have people dig in and scoop their portion right out of the squash. As for me, I literally can’t stop eating it once I start, so, it works better as a meal. I’d say the recipe will serve 4 as a full meal. I hope you’re ready to get cooking, because this one is going to knock your socks/headband/oven-mitt right off. Let’s go! 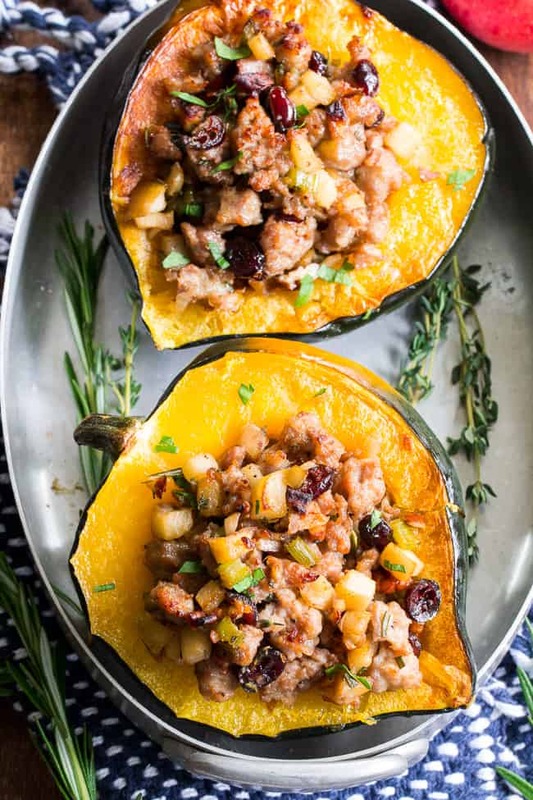 This Roasted Stuffed Acorn Squash is filled with all your favorites - sausage, apples, cranberries, onions, celery and savory herbs. The stuffing is packed with savory/sweet flavors and the perfect addition to a holiday gathering, or for any meal! 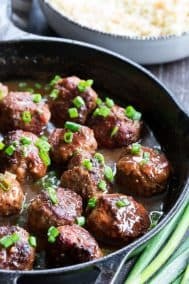 Paleo, gluten free, Whole30 compliant. First, roast the squash. Preheat your oven to 425 degrees F and line a large baking sheet with foil or parchment paper. While the squash roasts, prepare the stuffing. 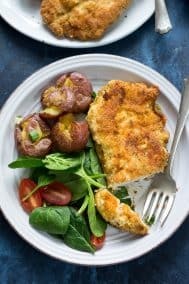 Heat a med/large skillet over med-hi heat and add a Tbsp coconut oil or ghee to melt. Add your sausage, breaking up lumps with a wooden spoon to evenly brown. Once browned, remove from heat and transfer to a plate, leaving fat in the skillet. Return skillet to medium heat and add the onions and celery, stirring while cooking to soften, about 3 minutes. Add the garlic and cook another minute, stirring to avoid browning. Add the diced apples, fresh herbs and salt and pepper to taste, stir to combine. Cook for another 1-2 minutes to allow apples to soften. Then add the cranberries, pecans, plus browned sausage back to the skillet, lower heat to med/low and continue to cook another 2 minutes to blend flavors. Once ready to stuff the squash, preheat your broiler and arrange the 4 squash halves face-up on the baking sheet. Scoop the stuffing mixture into each one, adding as much as you want to each. 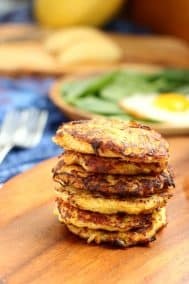 You might have leftover stuffing depending on how large your squash are and how much you fill them. Once filled, place the baking sheet under the broiler and broil until tops of stuffing and squash are nicely browned, 5 minutes or so. Garnish with fresh minced parsley, serve and enjoy! 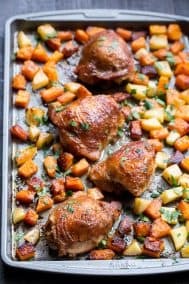 ***You can make the stuffing and roast the squash ahead of time, then simply fill and broil at the last minute for a quick meal! What do you HAVE to buy when you see it at the grocery store? Made this tonight and both my husband and I loved it. I didn’t have cranberries so I used raisins instead and it was very good. A perfect fall meal! Yum!! I made this tonight. It was absolutely delicious! I think you have created another acorn squash loving monster! Loved the recipe. Would love to try. Thanks for sharing. I wanted so very much to love this but it was honestly kind of bland. A few things I might try for next time (I haven’t lost hope that this can be delicious): (1) use real cranberries and not dried because mine were completely tasteless, (2) use ghee instead of coconut oil because I think that might add a nice twist to the flavor instead of just sweet, (3) use dried spices instead of fresh because maybe they’ll be more strong. Thank you for the wonderful recipes! 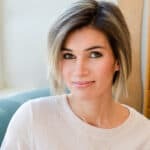 I’m starting to use your recipes more and more for inspiration as I come down to my last 5 days of Whole30 and will definitely use them A LOT MORE as I establish my Food Freedom! Delicious! We will make this again. Seriously one of the best meals I’ve ever ate! Such good flavor! I scooped out the remaining acorn squash from the half I ate, put it into a container with a few large spoonfuls of the stuffing still in the pan – my lunch tomorrow! And, I still have half an acorn squash with stuffing for another dinner this week. AND I have plenty of stuffing to freeze for another full acorn squash in a week or two! 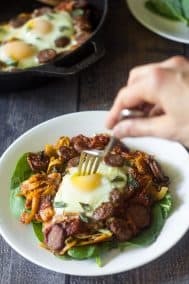 This recipe is most definitely a keeper – the best recipe I’ve found to use my pork sausage! So thrilled to hear that you liked it! And bonus using your own sausage, super cool! I made this tonight, and it was AMAZING. Unfortunately I’m the only one in my house who will eat it, but I will absolutely make this again. I had a lot of leftover filling so I’m going to pass it on to my Ma so she can try it herself! I made this yesterday and I wish I could give more than 5 stars! ? I made this per your recipe (minus the sausage) and it came out great. 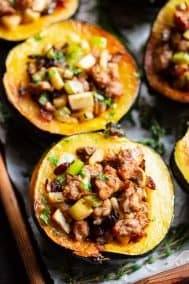 I then made by scooping the acorn squash into a casserole and adding the apples, chopped pecans, craisins and chopped pineapple and it also came out great! Thank you! That sounds delicious! Happy you enjoyed it! My family and I loved this. I ha to use half a pear and half an apple since my toddler decided to bite into them both. How did you rehe this when you made it ahead of time? Did you still broil it with the stuffing in it? This. Was. Amazing. My boyfriend and I LOVED IT. Cannot wait to make it again. Probably had enough stuffing for 3-4 small acorn squashes. Using the 2 that I roasted, I had about half of the stuffing left over. But was not disappointed!! 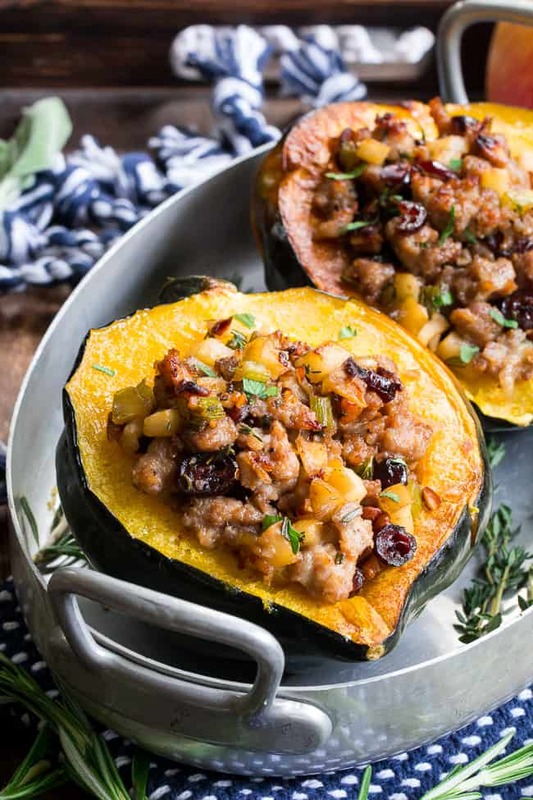 We put some arugula on the side of each of our half of the stuffed squash, and topped it with more of the stuffing. And I still have some stuffing left over, along with 2 stuffed halves of acorn squash. Very happy about this dish!! Thank you for sharing. It’s the perfect addition to a holiday gathering! Great recipe! It was delicious. Didn’t add pecans (just because I didn’t have the time to mess with getting them out of the freezer and toasting them), but the flavors were great. Made this last night and loved it! I have a vegan friend coming for dinner next week – do you think chopped mushrooms would work instead of sausage? So you think Italian sausage would work in this? Or would the spices contrast with everything else? 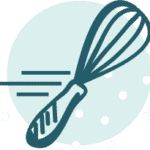 I LOVE every recipe I’ve made of yours by the way! wow, i never have seen anything like this!! 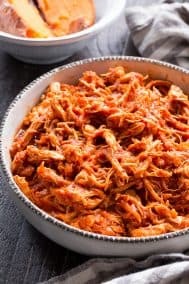 Can’t wait to try this recipe, I know my family will love it!